When I'm asked to describe my style of cooking I always struggle as it's a bit of a mish mash of everything. 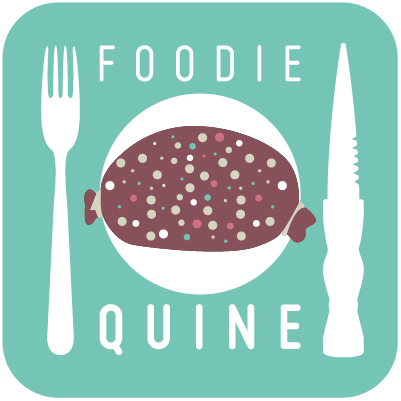 However if there is a particular area of speciality it's probably 'Quirky Scottish' or 'Scottish with a Twist'. Today's recipe definitely falls into that category. Surprisingly there's no Irn Bru or Tunnock's Teacakes involved but instead a culinary pun on a Scottish classic. Chocolate Haggis. This one will mess with your mind - it looks savoury but is infact sweet. 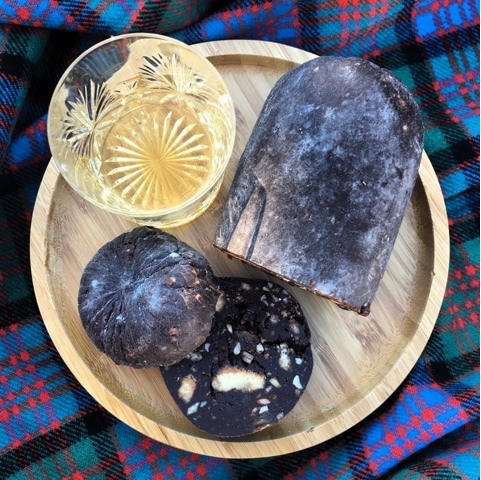 I took inspiration from the Italian concept of Chocolate Salami but by switching out ingredients for Shortbread and Whisky and shortening and fattening up the shape we get ourselves a Haggis! Perfect for those who are a wee bit squeamish about eating the real thing or are just too lazy to go out and hunt one down in the wild. The end result is a very decadent no bake fridge cake. Seriously rich and just a touch boozy. Place the sultanas and whisky in a small bowl and leave to soak whilst you prepare the remaining ingredients. Melt the butter in a pan, then sieve in the cocoa powder and stir until you have a smooth paste. In a separate bowl whisk the sugar and egg together until pale and creamy. Place the shortbread in a ziplock bag and bash it with a rolling pin. You want a mixture of chunks and crumbs. Combine the chocolate mix with the sugar/egg mix and stir in the shortbread, chopped mixed nuts and the whisky soaked sultanas, plus any remaining Whisky. Lay out a double thickness of clingfilm and tip the chocolate mixture out onto it forming a haggis shape. Chill in the fridge overnight to set. Remove the clingfilm and rub the outside with icing sugar. 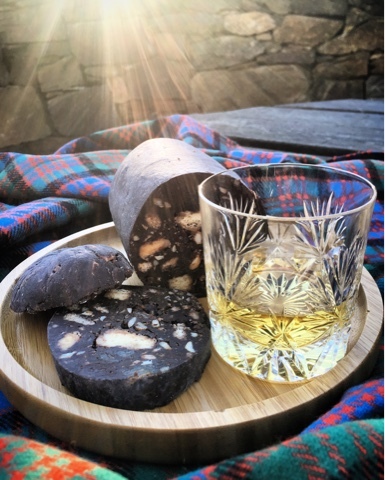 Slice and enjoy with a dram. A note on the raw egg issue. The current advice in the UK from the Advisory Committee on the Microbiological Safety of Food is that British eggs with the red "lion" brand carry such a low risk that vulnerable groups can safely eat them. WOW! I was so chuffed to see so many folk making and eating Chocolate Haggis yesterday for Burns Night. Please do keep tagging me in your photos and sharing you adaptations. 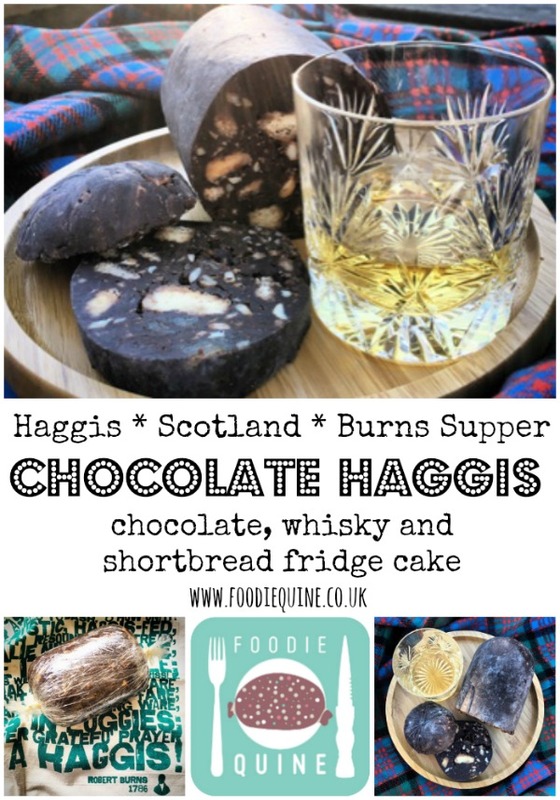 Thanks also to The Scotsman Food & Drink for helping to spread the Chocolate Haggis love. Ann McLean What a fantastic recipe! Made it on Sunday and it's been in the fridge since then. Came out slightly misshapen but tastes great - thanks! I've had 3 bits and the Auchentoshan single malt in the sultanas has my eyes crossing. It's totally sinful and delicious! Thanks to the 2nd Stonehaven Brownies for telling me that a Chocolate Haggis (without the whisky!) is their Burns tradition served with orange jelly 'neeps' ice cream 'mashed tatties' and of course washed down with a dram of Irn Bru!!! Much more popular than the savoury original!!! I NEED to make this, it sounds amazing! Thanks Rachel, I hope you enjoy it as much as we did. It didn't last long! This is a Haggis I could eat! I just knew that this would be up your street! Does Fanny do haggis at all? Thanks Jo, I think I'm going to have to make another one for the 25th! 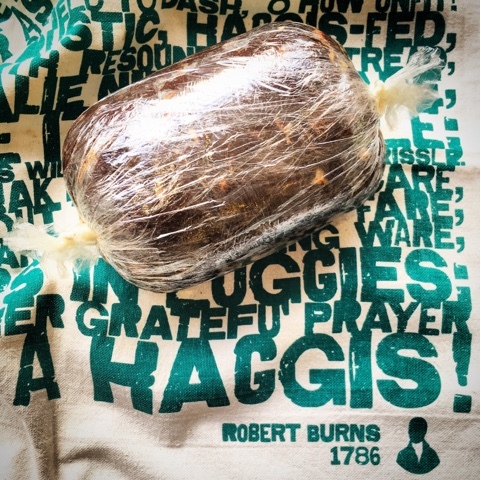 Haha - just love this idea, and as a veggie it is much more appealing than real Haggis! 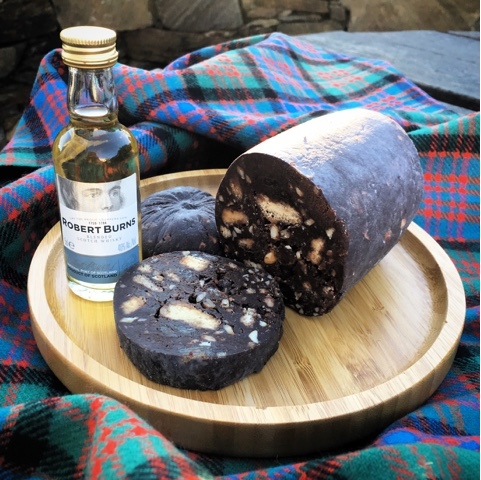 I've been meaning to try making some Chocolate Salami for a while but might give this a try in time for Burns Night instead! Glad to hear that you like it Kate, I have vegetarian friends who absolutely love Veggie Haggis so you should give it a try too. What a fun idea! I have never even had real haggis before, but I would definitely eat this. You are missing out if you've never tried Haggis. I reckon you should give both versions a go. I have to admit - the name threw me for a loop when I first read it, but this looks delicious! And what a nice surprise to find that it's even no-bake! Glad to hear that my culinary pun caught your attention! Love a cheeky fridge cake. I don't know much about Burns night being a southerner :) but love this idea! Shortbread, whisky and chocolate - I'm there! You now have me wondering if I could cook a haggis all day in the slow cooker. I think you need to try it out! Thanks Kirsty! Must admit I've had this in mind for almost a year now, and there had to be a dram to accompany. Thanks Jenny! It was only actually after I'd linked up that I realised I was possibly breaking the rules as its a no bake cake. Thanks for not excluding me! LOVE this! 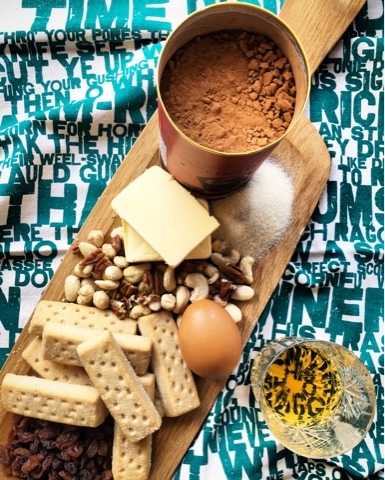 Chocolate, whiskey & nuts in one recipe - definitely got to try this! It's most definitely a winning combination of ingredients. It seems like there are other versions around but I think my shortbread and whisky could be a new twist! Veggie Haggis is pretty good too! 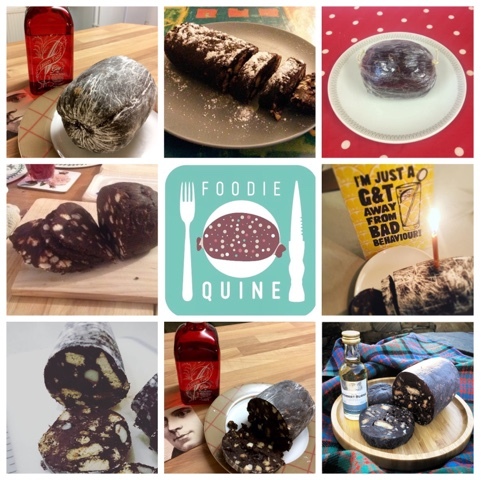 A Christmas Spices Haggis whether Chocolate or Traditional sounds fantastic!